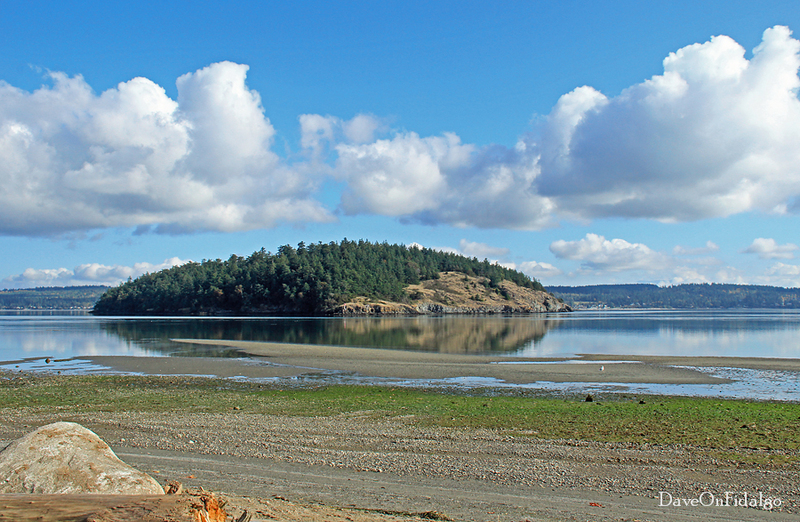 Ala Spit has just undergone a restoration project aimed at returning it to a more natural state (.pdf). 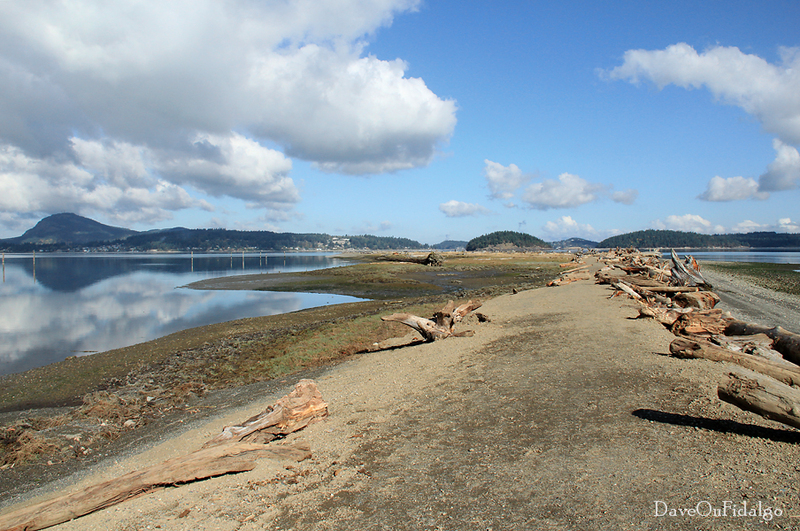 Rip-rap revetments have been removed and it is anticipated that some reshaping of the spit can be expected. 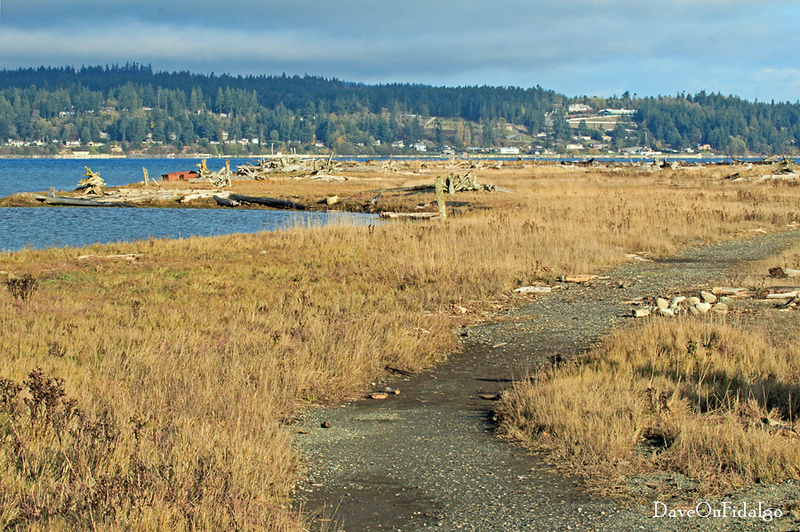 One goal of the project was to revitalize the pocket estuary north of the parking lot. These sheltered lagoons are important elements of wild salmon habitat. Salmon fry will spend time here protected from predatory fish. They must become accustomed to salt water before venturing out into the ocean. The small coastal grassland has now entered its winter dormancy. There were some remnants of wildflowers still blooming in October. I plan to return in the spring to see what else this garden has in store. 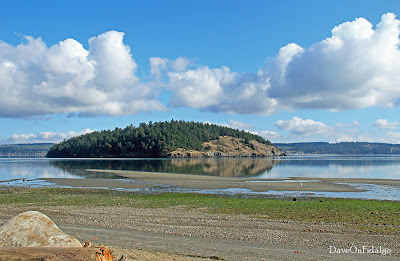 Beyond the spit in the photo is home on South Fidalgo Island. 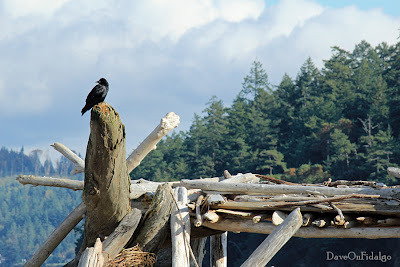 A diverse and healthy ecosystem naturally attracts wildlife. 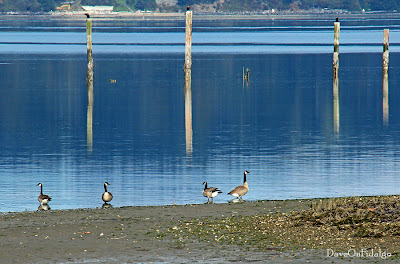 Canada Geese embark on a morning swim. 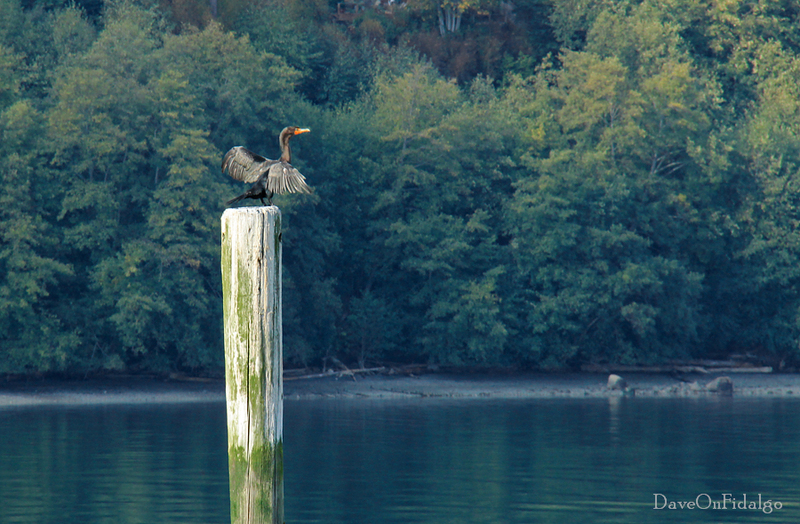 The old pilings provide perches for Double-crested Cormorants. 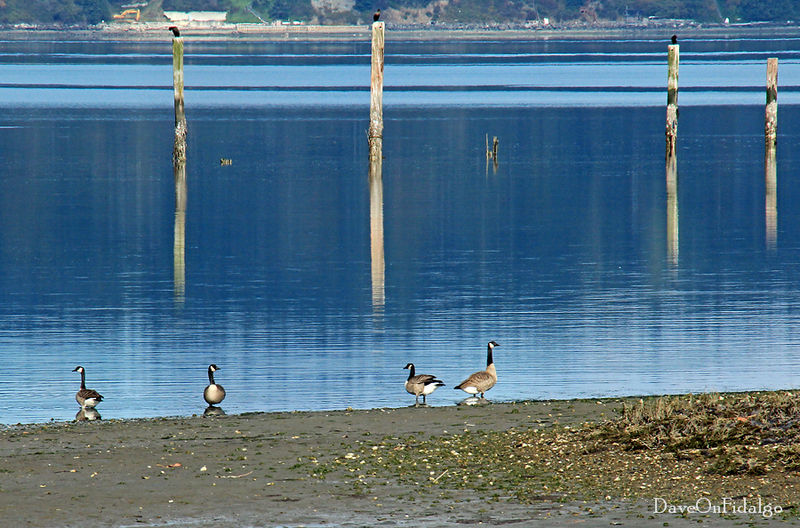 The pilings may reveal the site of an old ferry landing. There are similar ruins across the bay on both ends of Dewey Beach. 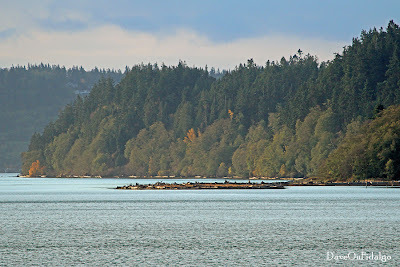 Before the Deception Pass Bridge opened in 1935, small ferries were the only means of travel between Fidalgo and Whidbey Islands. I would be interested to hear from anyone who knows the history behind these old posts. 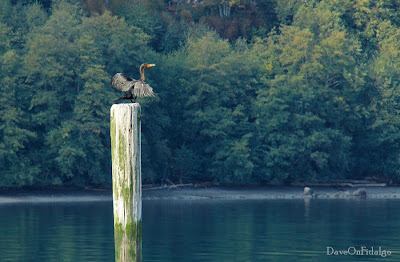 After diving, Cormorants will strike this "angel" pose to dry their wings. Captive birds will do the same after feeding, even if they are not wet. A Northwestern Crow has claimed ownership of someone's driftwood fort. 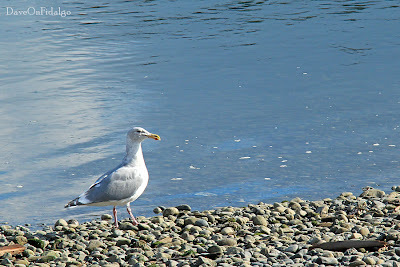 I always struggle identifying gulls, but I think this is a Western Gull x Glaucous-winged Gull hybrid bird. The mottled winter coloring of the head and neck, pink legs, black wing tips, dark eye, large yellow beak and red beak spot are the clues. I could be dead wrong. Herring Gulls and Thayer's Gulls have similar markings as do Glaucous-winged x Herring hybrids. See the problem? On the east side looking towards Hope Island, a low tide terrace of sand is visible during minus tides. This is the windward side of the spit during storms. 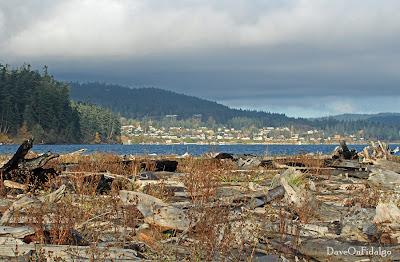 The driftwood field is also concentrated on the windward shore (foreground), again because of the direction of storms. 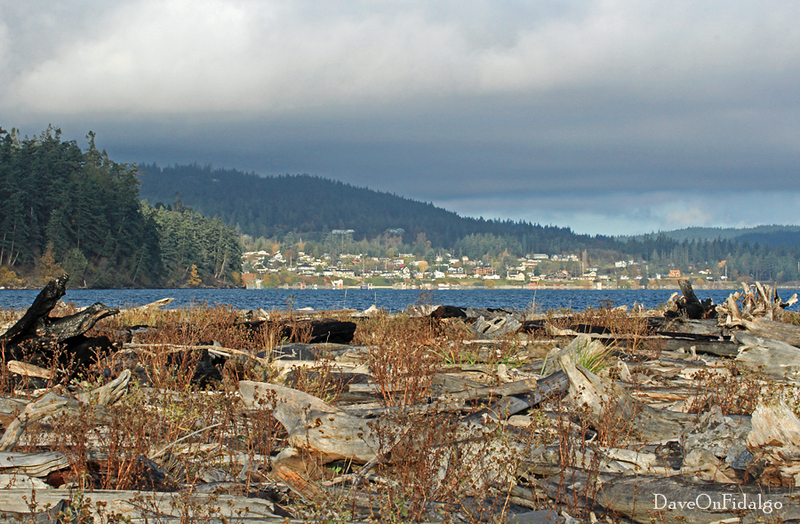 Always keep in mind that driftwood in natural places should not be collected or disturbed. It stabilizes beach erosion and provides habitat for wildlife. 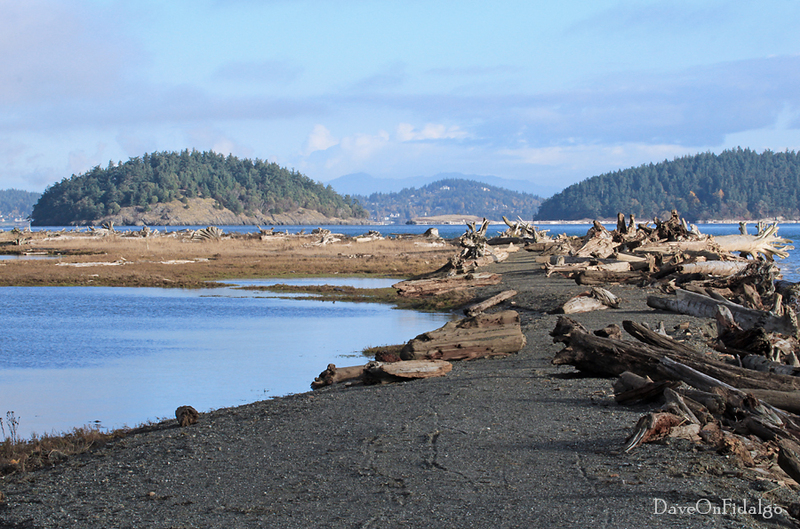 On the left, Hoypus Point on Whidbey marks the entrance to Deception Pass. 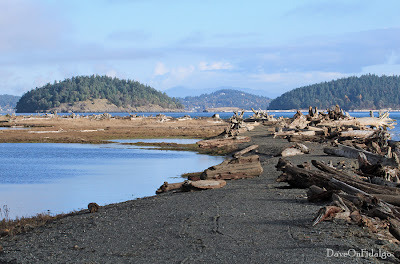 Across Skagit Bay beyond Hoypus is Dewey Beach on South Fidalgo. One of the best kept secrets of Whidbey Island. Love the Spit!